You don't need a lot of space to make a big impact. 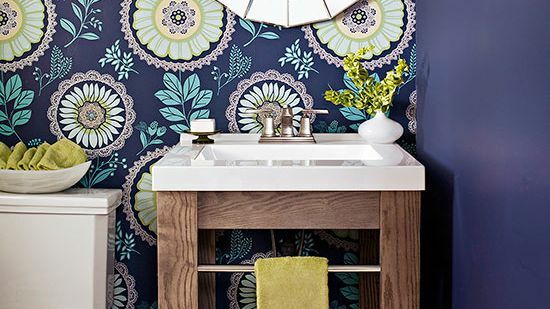 Tour these stunning small bathrooms for design inspiration, each with distinct style. 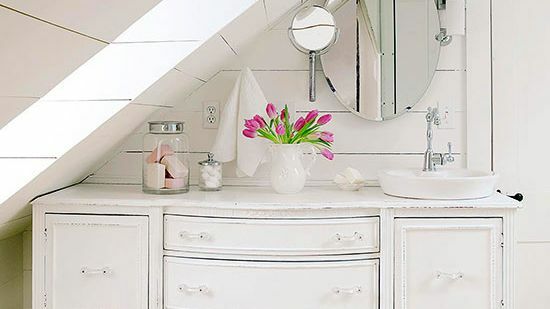 Space-saving moves and budget-friendly materials add function and style to this small attic bathroom. An old sideboard-turned-vanity tucks neatly beneath the eaves. 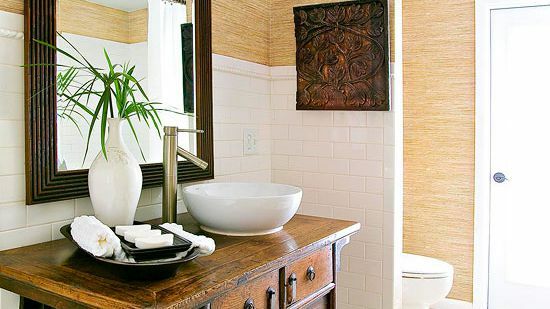 The vanity's surface was gently aged, which blends well with the bathroom's vintage-meets-cottage look. 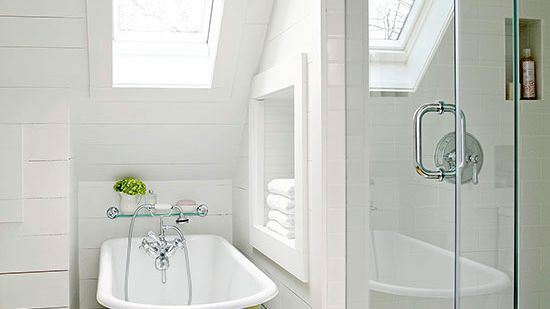 A long narrow skylight above the tub welcomes views of the sky and helps the angular space feel more open. The outside of the claw-foot tub was painted the same chartreuse hue as the floor, which creates a clean, uninterrupted look. The room's slim 8x12-foot dimensions are maximized by a clever floor plan. A built-out wall under the eave offered space for the toilet and a built-in, 10-inch-deep storage cubby behind it. A glass shower surround allows the eye to move seamlessly around the room, making the space feel larger. 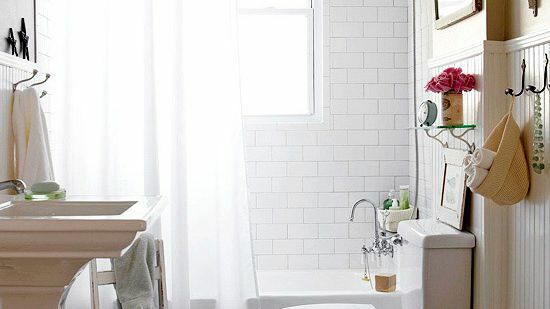 Classic subway tiles on the shower walls give the bathing area a vintage vibe. 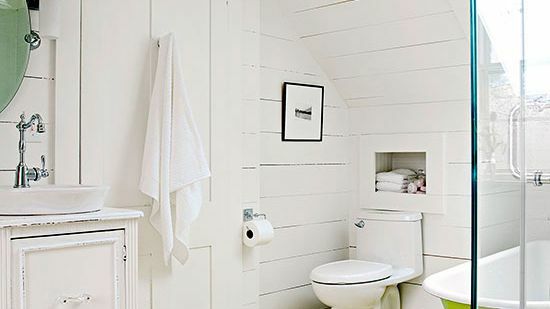 Pine boards painted white and adhered to the walls give the bathroom oodles of cottage character. Beaded board, a staple of many cottage homes, adorns the inside of the built-in storage cubbies, providing another layer of vintage character. 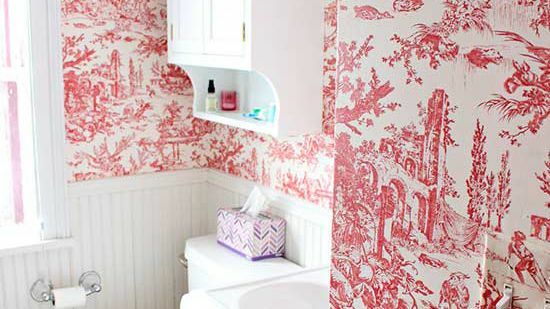 Although small on square footage and small on budget, this bathroom packs in style for less. Classic white fixtures, timeless subway tile, earthy textures, and lots of light give this bathroom a unique east-meets-west vibe. The vanity, an Asian altar table snagged from an imports store, makes a perfect focal point. 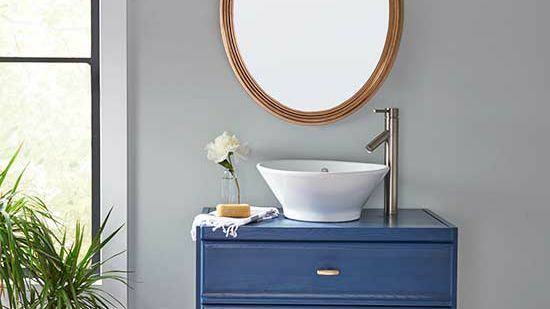 Plan for the perfect bathroom with our Remodeling Guide. Get it INSTANTLY here. Interestingly enough, the bathroom leads directly to an outdoor pool area. To increase the amount of natural light streaming in from the outside, the homeowners opted for a 24-inch-wide door with a glass insert. A frosted film applied to the window permits light while still providing privacy. To preserve the vanity's limited drawer space, a vessel sink was installed atop the table. 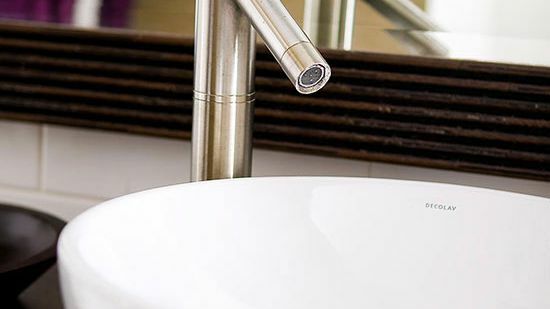 A sleek brushed-metal faucet adds a modern touch amidst an array of Asian-inspired decorative touches. 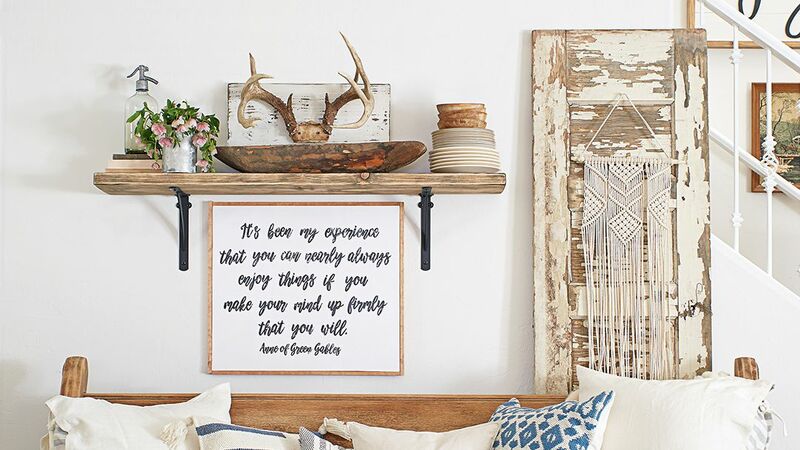 A mangrove root -- driftwood dragged home from a trip to the beach -- brushed with a dark stain functions as both a statement-making art piece and a handy storage solution. Hung on the wall next to the shower, the piece provides a convenient place to stack towels. 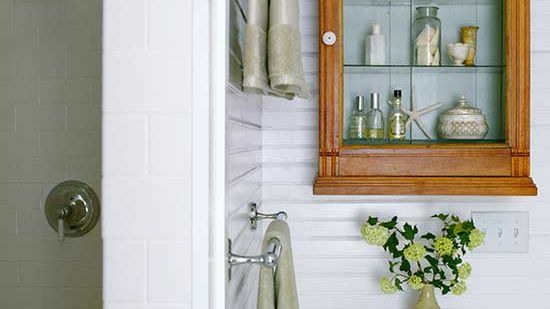 Bright white finishes and clever storage help this small bathroom live large on style and function. 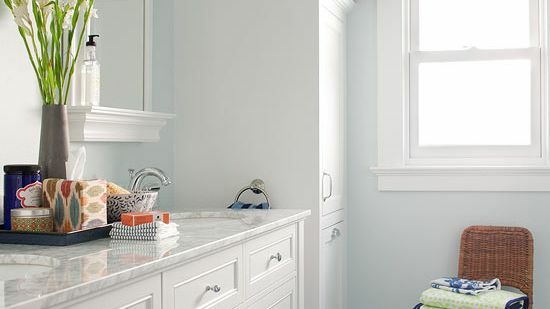 The simple white-on-white color scheme and mirror-front cabinets give the windowless bathroom a light and airy feel. Squeezing a shower into the tiny bathroom was a challenge, but a niche at one end of the room provided the perfect place to do it. 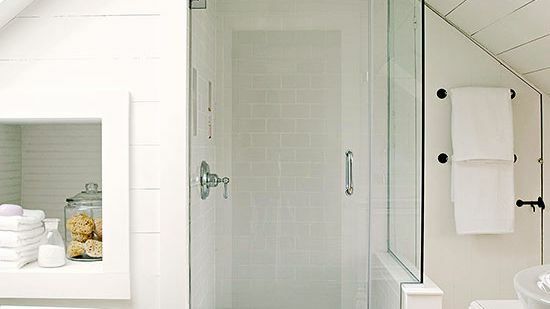 The frameless shower door helps the bathing area feel connected to the rest of the room. Honeycomb-shape tiles used on the bathroom floor are repeated on the shower floor, which also helps the two spaces feel connected. 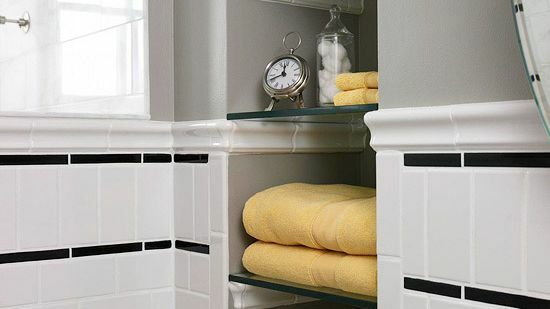 Shelves built in between the wall studs provide additional storage space for fragrances and hand towels. The cubbies add depth and dimension to the small space. A bench topped with a terry cloth seat cushion offers bathers a spot to dry off. 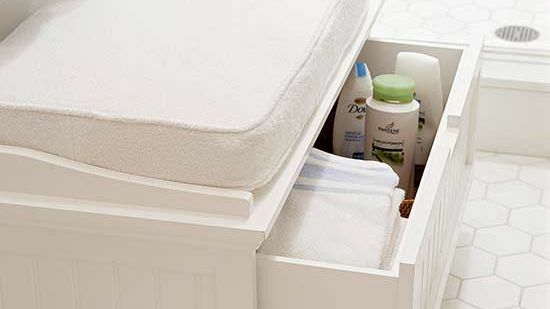 A deep drawer below the seat keeps towels and other bathing necessities within reach of the shower. A dark vanity, glazed white penny tiles, and a stylish medicine cabinet lend this bath a contemporary vibe that blends with the home's classic style. 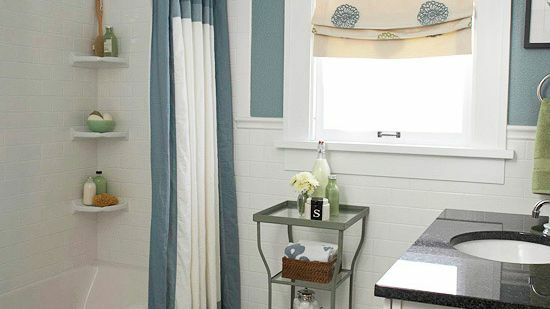 Touches of color, such as a fresh coat of gray-blue wall paint, a green rug, and a bold, patterned shower curtain, are eye-catching details that add interest. 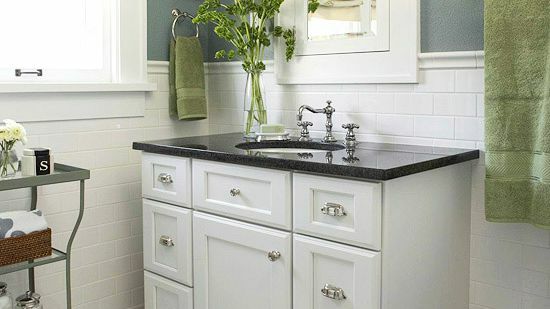 A dark vanity with a granite top lends a polished touch and provides much-needed storage in this small space. 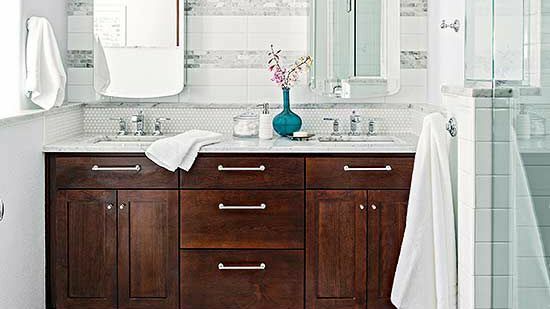 Its rich wood tones bring visual contrast to the mostly white bathroom without overwhelming the space. A brushed-nickel faucet was a small upgrade that adds big style points. The bathroom's original mirror was in good condition, but this medicine cabinet offered practical extra storage without costing a fortune. Its decorative silver frame lends a touch of glamour and interest to the room. 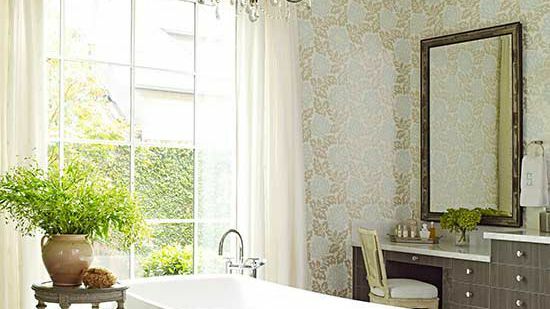 This classic bath gets its appeal from vintage-inspired details. Everything except for the bath and toilet were overhauled to create a modern interpretation of a classic setting; the pedestal sink, beveled-edge mirror, subway-tile bath, and tan floor tile installations lend themselves to the homeowner's affinity for antique accents. To make the bath look larger, the vanity was removed and replaced with a slim pedestal sink. 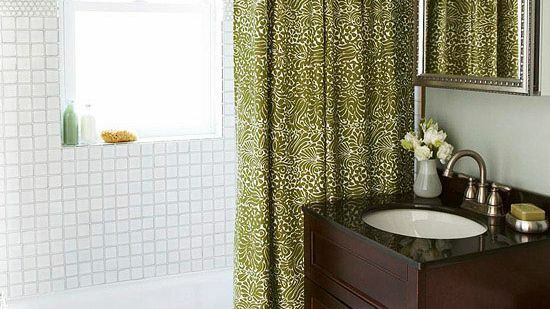 Beaded-board panels and a beveled-edge mirror showcase the soft, vintage style of this bath. 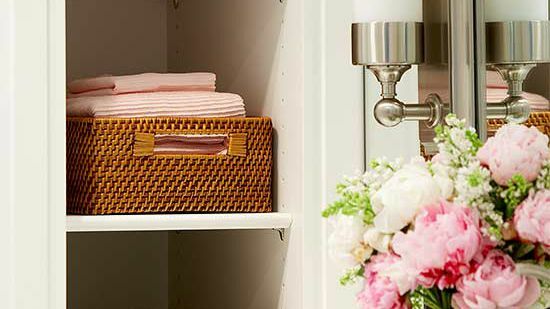 Wall-mount hooks are put to use as a towel rack and a spot to corral jewelry in an easy-to reach location. 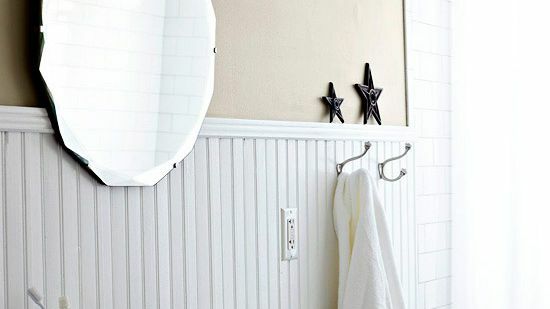 A worn mirror above the toilet draws natural light into the small bathroom and keeps with the color scheme. A merger of a half bath and an adjacent coat closet created to this light and airy guest bathroom. 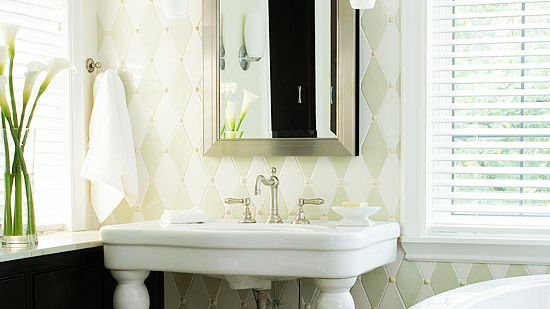 Brick-shape marble tiles in the shower, white subway tiles for the remaining walls, and hexagonal mosaic floor tile give the bathroom a bright, beautiful look. A small window salvaged from a potting shed allows natural light to soak the space. 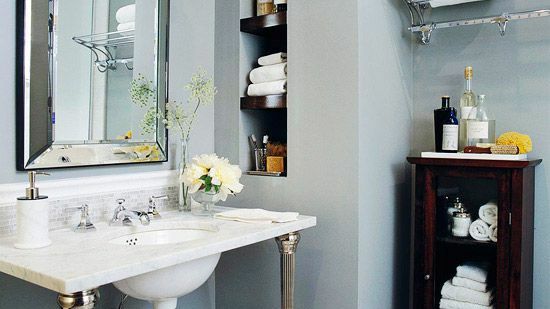 A pedestal sink offers vintage appeal without taking up much floor space. Borrowing space from a stairwell directly behind the bath wall made room for this valuable storage and display alcove above the toilet. 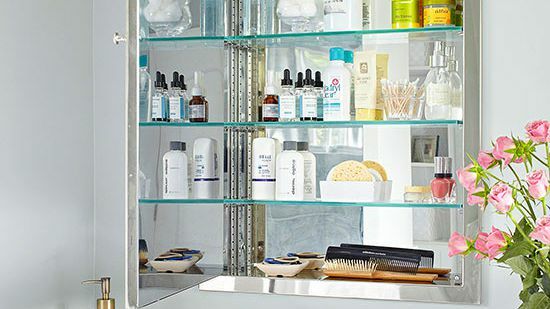 Glass shelves conveniently house hand towels, soaps, candles, and more. Privacy glass on the door screens users, adds character, and allows additional light to enter from the hallway. 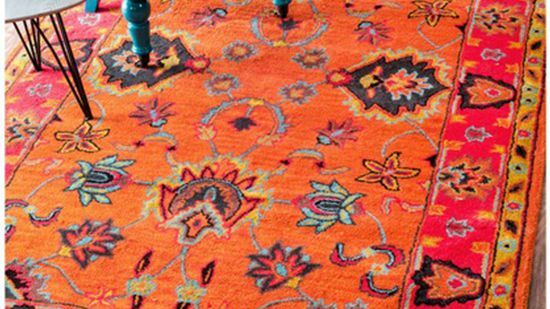 This reinforces the room's light and airy appeal. 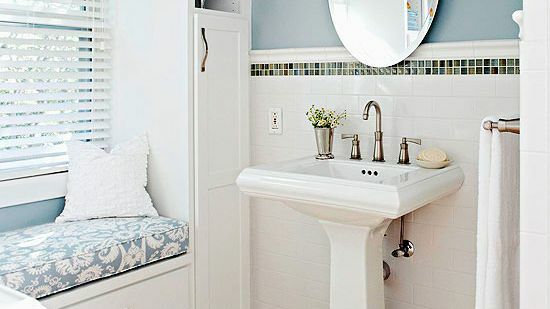 The small television squeezed into a wall recess is a surprising amenity in this petite guest bath. 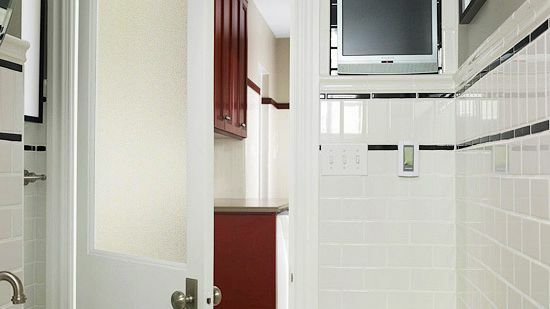 A recessed medicine cabinet -- complete with an electrical outlet -- provides handy toiletry space and features a framed photograph mounted to its door. 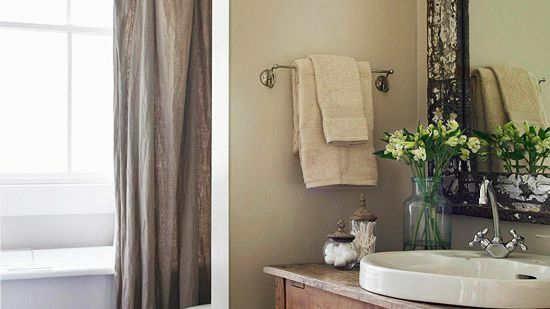 Salvaged items, smart buys, and a surplus of natural light give this small bathroom greater appeal. The focal-point vanity is made from a piece of salvaged iron fencing that was welded to an iron frame to support the counter and sinks. 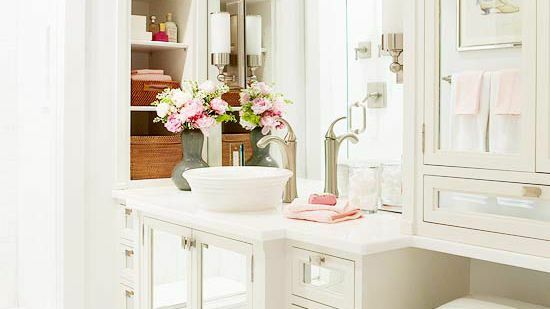 The vanity is topped with gorgeous limestone and a pair of elegant vessel sinks. The flooring is inexpensive ceramic tile that mimics a classic pattern in black and white marble. 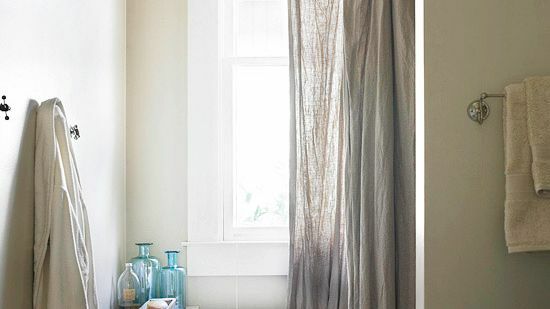 Four-pane double-hung windows let in a plethora of natural light, which visually expands the bathroom. Double recessed medicine cabinets hide toiletries on both sides of the vanity and keep the limestone counter free of clutter. 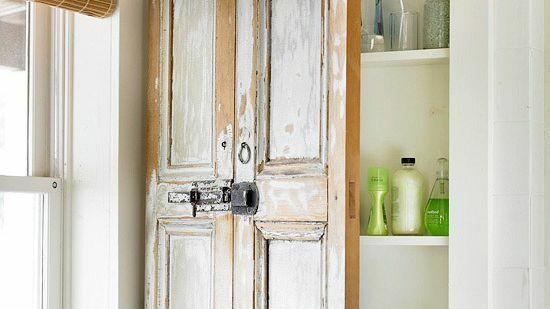 The medicine-cabinet doors -- made from old shutters that were cut to size -- reinforce the vintage appeal of the bathroom. 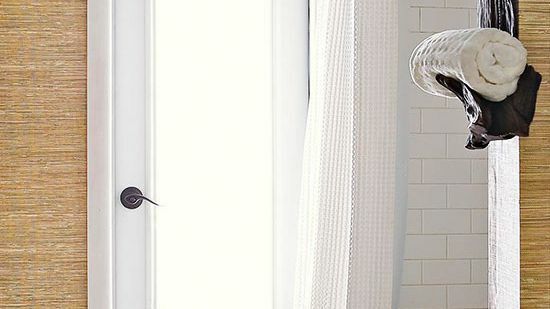 This tiny shower spot feels spacious thanks to natural light that pours in through the four-pane casement windows. 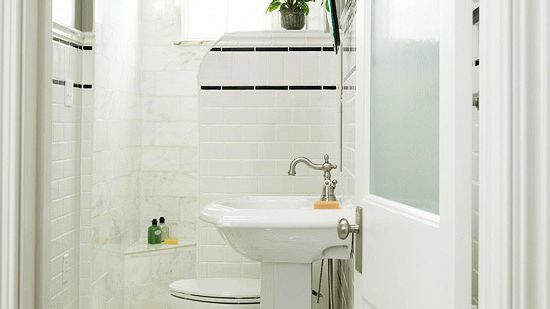 Classic white subway tile covers the shower walls and keeps the space bright. Wide crown molding above the windows matches molding found throughout the home, adding even more character. The wood window frames and molding were painted with marine-quality enamel to protect against water. 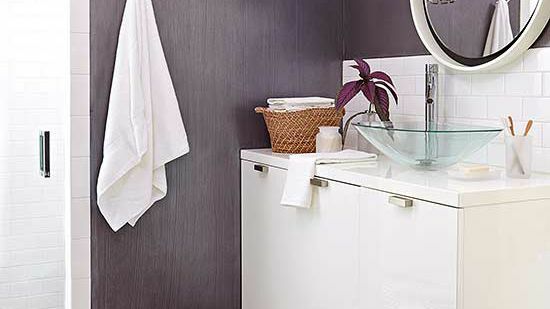 Here, a top-to-bottom renovation resulted in an efficient and elegant small bathroom. The reconfigured layout eases traffic in and out of the room and makes the small area feel spacious. Classic white subway tile on the shower and bathroom walls replaced dated pink tile. The shag carpet was swapped for something more attractive and timeless: black and white hexagonal mosaic floor tiles. 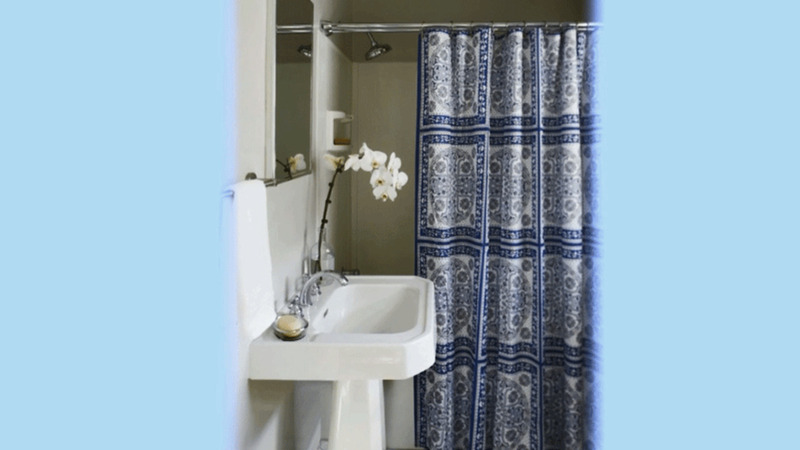 These elements ensure that the small bathroom will age gracefully. 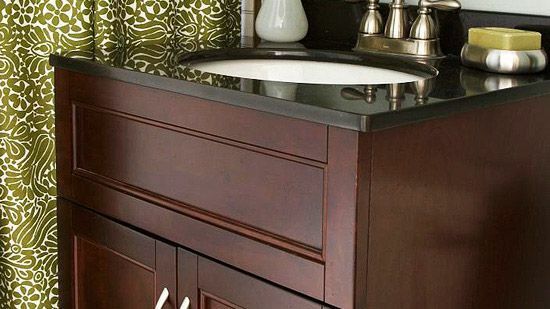 A white furniture-style vanity boasts vintage style and sufficient storage space. 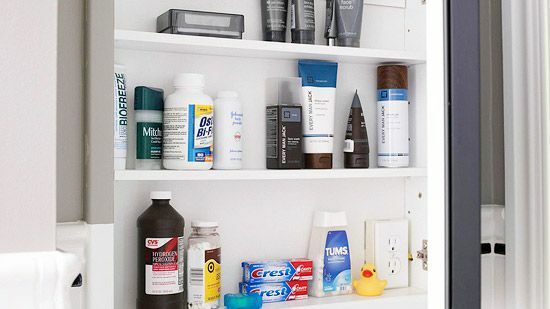 A built-in medicine cabinet also conceals toiletries. The vanity is topped with striking dark granite, an undermount sink, and a polished-nickel faucet in a darling old-world design. 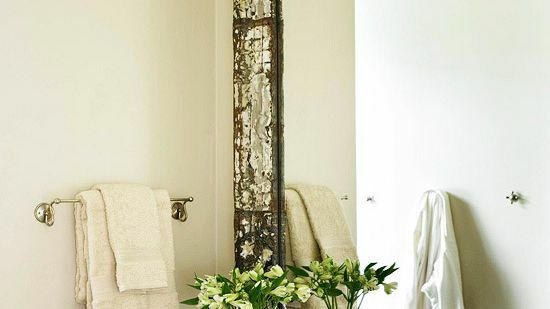 Polished towel bars, sconces, and cup pulls on the vanity complete the classic look. Low ceilings add charm instead of confusion in this small bathroom. Reflective white surfaces create a sense of spaciousness, taking the focus away from the ceiling's height. 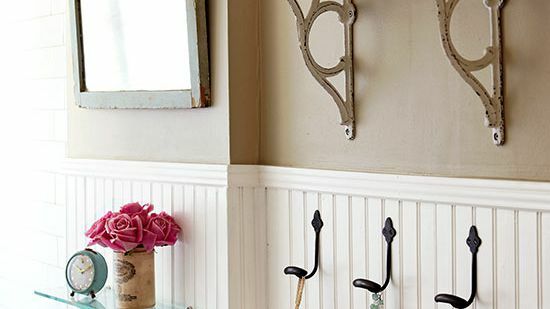 A pedestal sink sets the tone for a vintage-style space. Classic beaded-board wainscoting -- installed horizontally for interest -- covers the walls and ceilings, while hexagonal mosaic tiles cover the floor. 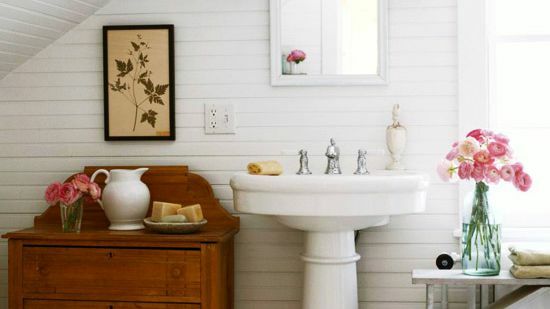 An antique pine commode adds storage and warmth to the otherwise white bathroom. 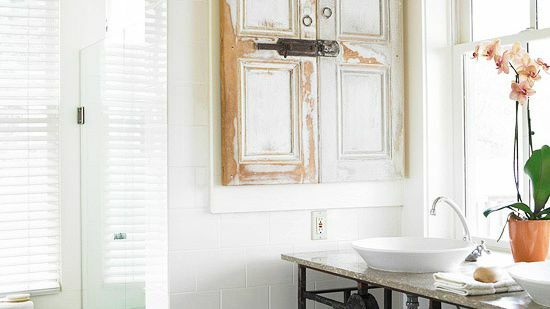 An antique claw-foot tub was restored and painted white to match the walls, and now it serves as the striking focal point. 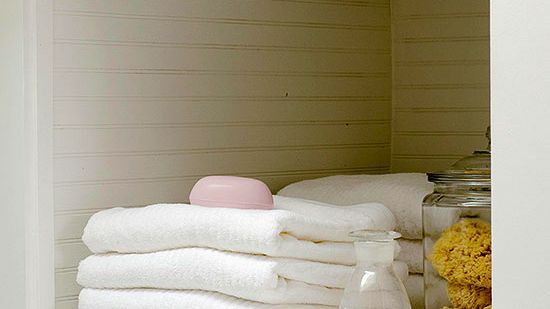 A salvaged shelving unit fits perfectly at one end of the tub to organize soaps and towels. The piece is covered in its original blue-green paint to add subtle color and lots of character. 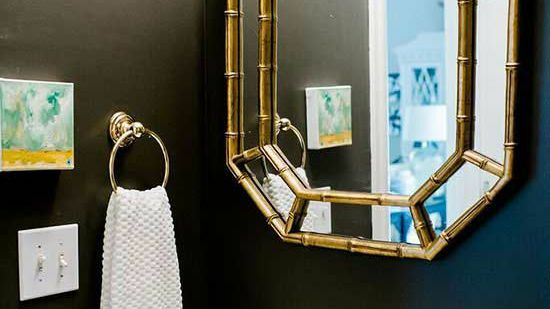 An old stair railing is used as a handy towel bar. 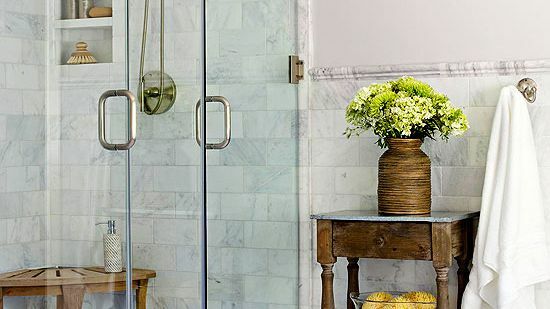 A refreshing walk-in shower -- wrapped in white subway tile -- squeezes into the opposite corner. The shower wall stops short of the ceiling to keep it from feeling closed off and to allow in natural light. 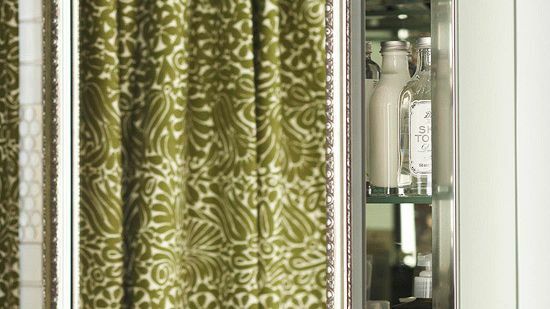 Above the toilet, an antique pharmacy cabinet displays glass storage containers and decorative accents. High ceilings, an abundance of natural light, and stylish salvaged materials make this a small bathroom to show off. An antique French wood console table was converted into the vanity. The floors are made of knotty pine planks that were reclaimed from a warehouse. The freestanding tub was salvaged, reglazed, and updated with a rain-style showerhead. The ceiling height and the large window create a feeling of openness, making this small bathroom feel big. An oversize mirror reflects light and makes the room feel large. 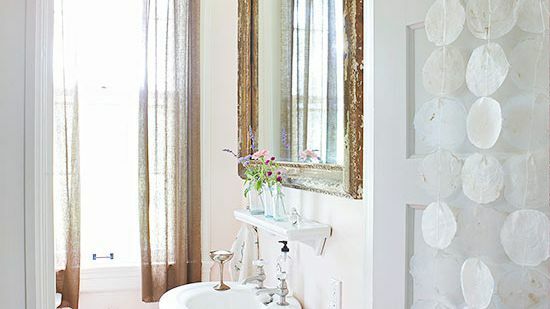 Its weathered antique frame reinforces the vintage theme and makes the mirror a focal point. The vanity boasts a large drop-in sink, complete with a soap dispenser and plenty of counter space. 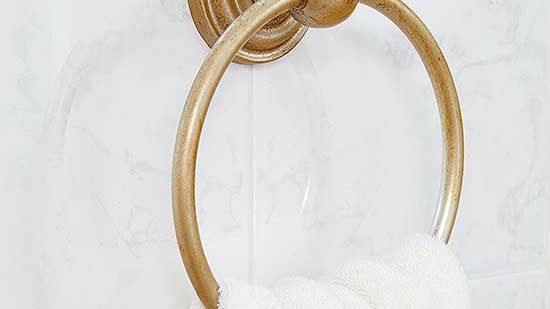 Antique hot and cold knobs -- seen through the mirror -- find new life as handy hooks for towels and robes. 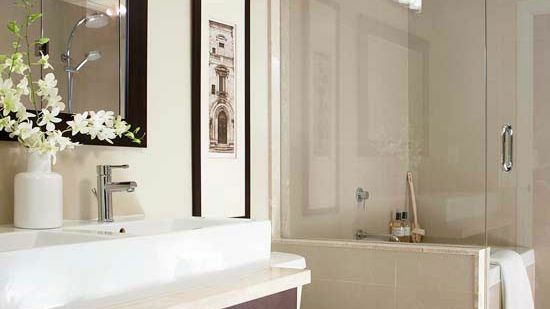 While soaking tubs such as this one are graceful and gorgeous, they lack the storage space offered by built-in tubs. 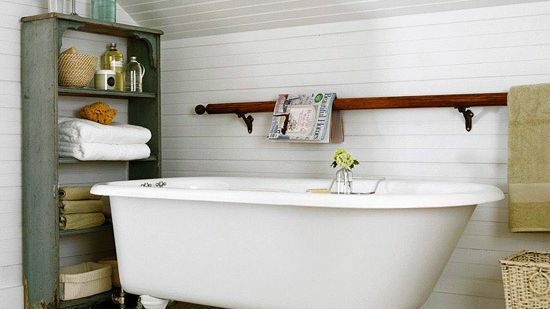 A floating shelf, installed along the wall by the tub, remedies the situation, providing a spot to store shampoos, soaps, and bath necessities. A console vanity, 9-foot ceilings, and clear-glass shower doors create a sense of openness in this small basement bathroom. The vanity's fashionable marble top and chrome legs make it the focal point while staying true to the open design of the room. 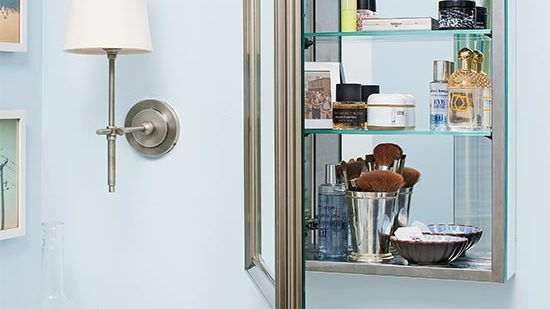 Built-in walnut shelves keep toiletries and more close at hand while the limited counter space stays clutter-free. 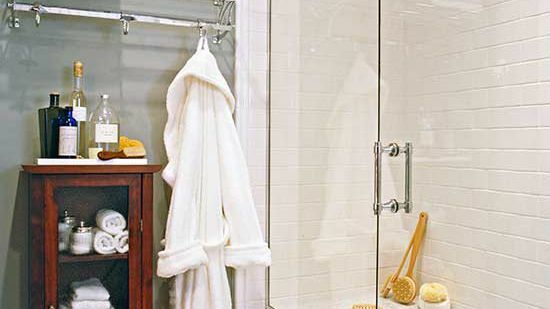 A thin walnut cabinet fits in a small space between the wall and the shower to house extra towels. 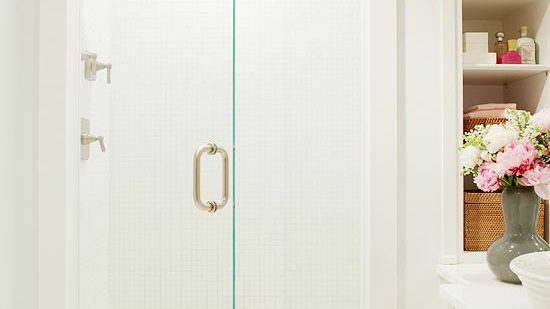 Tall, clear-glass shower doors emphasize the small bath's high ceilings and create the illusion of more room. 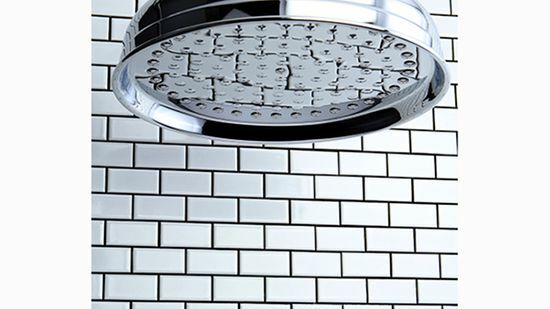 The white subway tile and chrome fixtures reflect light, contributing to the sense of spaciousness. 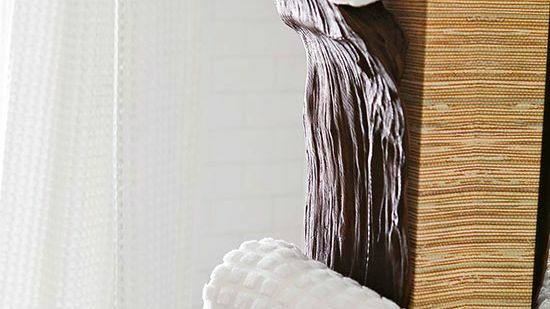 Basket-weave tile covers the floor and carries into the shower for continuity.